Now it’s easy to engage and inspire everyone in the room. 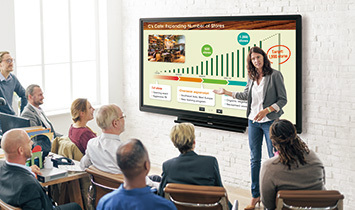 With the Sharp PN-80SC5/70SC5/60SC5 interactive touchscreen monitor, you have the ideal focal point for meetings, presentations, or lessons. Direct bonding technology makes the touchscreen feel and appear impressively natural to users and viewers. Smart and convenient SHARP Pen Software facilitates discussions and real-time information sharing. Thanks to multi-touch sensitivity, up to four people can write freely onscreen at the same time for effective and lively exchanges of opinions. And handy front-access buttons enable quick operation of common functions. With the PN-80SC5/70SC5/60SC5, it’s easy to create, learn, and share more effectively. The full HD (1920 × 1080-pixel) resolution of these large 80/70/60-inch models ensures that detailed text and images are reproduced vividly and accurately. Dynamic videos, charts, paintings, photos, and more—they’re all brought to life on the big screen in a way that simply can’t be achieved with normal textbooks and printed materials. Even in bright rooms, text and images are displayed beautifully, so that everyone can stay focused on the discussion. Keep everyone actively involved in the meeting or lesson by letting them write on the screen at the same time. Because the PN-80SC5/70SC5/60SC5 can recognise 10 touch points, it allows up to four people to use a touch pen or finger to add their creative input when the inspiration strikes. Brainstorming sessions, meetings, and classroom activities become more lively and productive. Note: When multiple touch pens are used simultaneously, they have the same pen settings. The easy-to-launch SHARP Pen Software user interface incorporates a menu comprising smartly arranged icons that provide easy access to pen settings and other useful functions. In overlay mode, you can write onscreen annotations or graphics directly onto photos, videos, Adobe® PDFs, and common Microsoft® Office files. Text and graphics written on the board can be stored in USB memory* or sent directly via e-mail to selected recipients. The software links smoothly with the PowerPoint®application, enabling you to perform various control operations during slideshow presentations. Documents and images scanned from a compatible Sharp MFP can be imported directly to the SHARP Pen Software for display on the PN-80SC5/70SC5/60SC5. For added convenience, image data shown onscreen—including notations—can be saved to a PC or sent directly to an MFP for printout. SHARP Pen Software features a handwriting recognition function* that converts selected onscreen handwriting into standard text. It can also recognise handwritten shapes—such as circles, triangles, and straight lines—and automatically convert them into objects. This smart and convenient function makes it easy to utilise onscreen content to make a legible record of your lesson or meeting. * Works with languages supported by both Windows® OS and SHARP Pen Software. This original Sharp software*1 lets you easily view, manipulate, and annotate various kinds of files*2, including Microsoft files, PDFs, web pages, and image and video files. All of these can be displayed on the screen as “sheets”. There’s no need to open the respective applications, and you can present all the different files simultaneously in the same work area. The onscreen layouts of sheets can be stored for later retrieval, so you can easily restart a discussion where you left off. Using this smart software helps to make discussions more dynamic and involving. *2 Viewable files: Microsoft Office (Excel®, Word, PowerPoint), PDF, JPEG/PNG/BMP/TIFF, and WMV/AVI/MP4/FLV. This software*1 is especially effective for communications with large audiences. 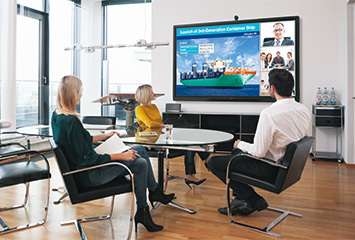 By allowing the PN-80SC5/70SC5/60SC5 to share its onscreen content with up to 50 devices*2, and by enabling the exchange of files between those devices, SHARP Display Connect facilitates lively discussions and paperless meetings in both business and educational settings. *2 Please comply with the license agreements of your OS and installed applications. OS requirements (as of March 2017): Host: Windows 7, Windows 8.1, Windows 10; Client: Windows 7, Windows 8.1, Windows 10, Mac OS X v10.7, v10.8, v10.9, v10.10, v10.11, macOS v10.12, Android™ 2.3–7.1, iOS® 6–10. Connecting 26 or more mobile devices requires at least two LAN access points. Thanks to direct bonding technology, the PN-80SC5/70SC5/60SC5 provides a consistent and natural feeling when you write on the screen. With this technology, the LCD panel is bonded directly to the protective glass layer, thereby eliminating the air gap between them. This minimises the parallax difference and reduces the reflection and refraction of light. As a result, onscreen touch and writing operations are smooth and the display looks natural and offers clear visibility. Protecting the glass screen is an anti-glare film that works to reduce glare and reflections and minimise fingerprint soiling. Even in brightly lit rooms, documents and teaching materials are easy to read. With it’s beautifully curved corners, the PN-80SC5/70SC5/60SC5 has been designed with both style and user safety in mind. The PN-80SC5 and PN-70SC5 have four removable handles—two on the left side and two on the right—to allow for easy and safe transportation. The PN-80SC5/70SC5/60SC5 is compliant with the CUD (colour universal design) standard*, which specifies designs that take into account people’s differing colour perception abilities. * Based on regulations established by the Color Universal Design Organization (CUDO), a non-profit organization in Japan. Two built-in speakers (10 W+10 W) let you hear audio information accompanying videos or other content. No external speakers are required. On the front bezel are buttons for frequently used functions such as power on/off and input switching, along with buttons for other useful functions. Designed with the convenience of users in mind, the buttons are handily sized and angled for easy access. At the touch of a button, you can instantly switch between HDMI 1 and D-sub inputs. This button turns off the backlight, saving energy during rest breaks in meetings or lessons. Pressing any key turns the backlight back on instantly. A press of this button lets you temporarily freeze or unfreeze the screen. While the display continues to show a paused onscreen image, you can work on the connected PC without displaying its operation screen. A web camera can be attached easily to one of three mounting positions: one on the top-centre of the frame, one each on the left and right parts of the pen tray. This gives you flexibility when setting up a videoconferencing system. The PN-80SC5/70SC5/60SC5 can be used continuously for up to 16 hours per day, providing reliable performance in the schoolroom or office. *1 UV2A stands for Ultraviolet-induced Multi-domain Vertical Alignment, a photo-alignment technology that ensures uniform alignment of liquid crystal molecules. *2 Maximum colours of LCD panel. The number of colours that can be displayed simultaneously is 16.77 million arbitrary colours out of 1.07 billion colours. *3 Brightness depends on input mode and other picture settings. Brightness level will decrease slightly over the lifetime of the product. Due to the physical limitations of the equipment, it is not possible to maintain a precisely constant level of brightness. *4 Excluding the touch sensor part around the LCD panel. *5 Including anti-glare film on the front. *6 Approximate distance at which the glass panel can withstand the impact of a 500-gram iron ball dropped on its centre. *7 Use a commercially available connection cable for PC and other video connections. *8 Video and component video are switchable; use the menu to select. *9 The AC power cord is an inlet type. The cable is bundled (3 pins). *10 Connect the bundled USB cable to the computer for touch operation. If connected via a USB hub, the PN-80SC5/70SC5/60SC5 may not be recognised correctly and operation may be unstable.